There aren’t too many big burly blokes who can say they’ve successfully landed a 100kg plus Bluefin Tuna. And there are even fewer ladies who would entertain the idea of attempting such a feat. However, Leanne Dixon has not only landed a whopping 294.5kg Bluefin Tuna but also potentially smashed a world record for a woman using 60kg tackle in the process. That’s pretty impressive in anyone’s book, but more so, when you consider that Dixon doesn’t even weigh 60kg herself! So what’s next for this fishing high-achiever and commercial skipper? More fishing of course, plus running guided trips and taking fishing charters from the Bay of Plenty to Northland. But to achieve all this, Dixon requires a very special kind of boat— one that’s stable, comfortable, offshore capable, has a toilet, an abundance of storage, is built to survey, fits on a trailer and of course, has to catch big game fish. Faced with this long list of requirements, who does a fanatical fisho trust to custom-build their dream weapon? 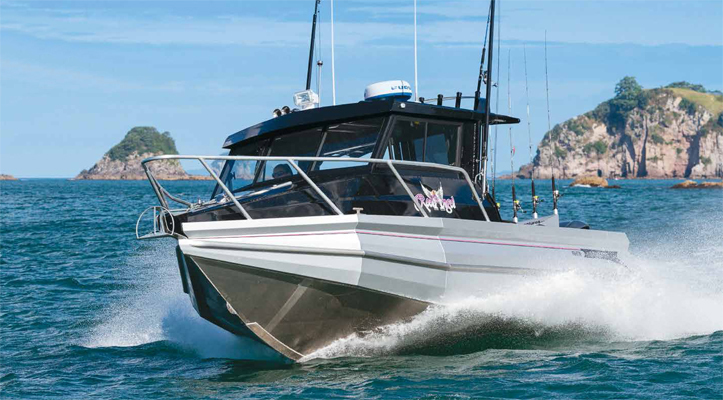 Senator Boats’ RH770 fitted the bill.